I am loving the chance to show off my favorite mother's jewelry designs from Nelle and Lizzy! I am Page Elizabeth (aka Lizzy) and I am the mom of three energetic boys - Miller, Jack and Wyatt. Although they are not little anymore - all of them are over 6 feet tall now (!) - they will always be my babies. 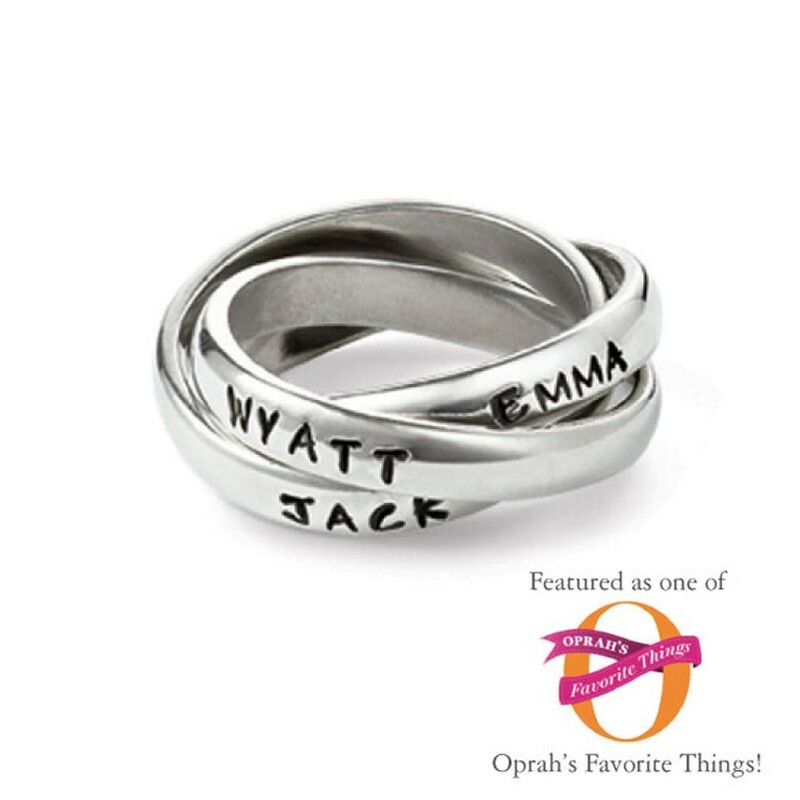 Below are the products I love the best in our stamped jewelry line. The two items I wear daily are my triple band Mother's Ring and three stacked Beloved Bangles. Martha (aka Nelle) and I stamped our rings as the first official rings we ever made and I don't think mine has left my finger since. It is a little (a lot!) scratched and while we have all the machines I need to refurbish it back to it's original luster, I wouldn't dare. I have worn it for 10 years as my boys have grown from children to men and it means as much to me as my wedding ring. It will go with me to my grave! Mother's Ring - see above but again let me say I treasure it completely! Beloved Bangles - I love to the simple look of these stacked bracelets. I wear them combined with other jewelry and I have and since mine are mixed metals they always look great with whatever I pair them with. 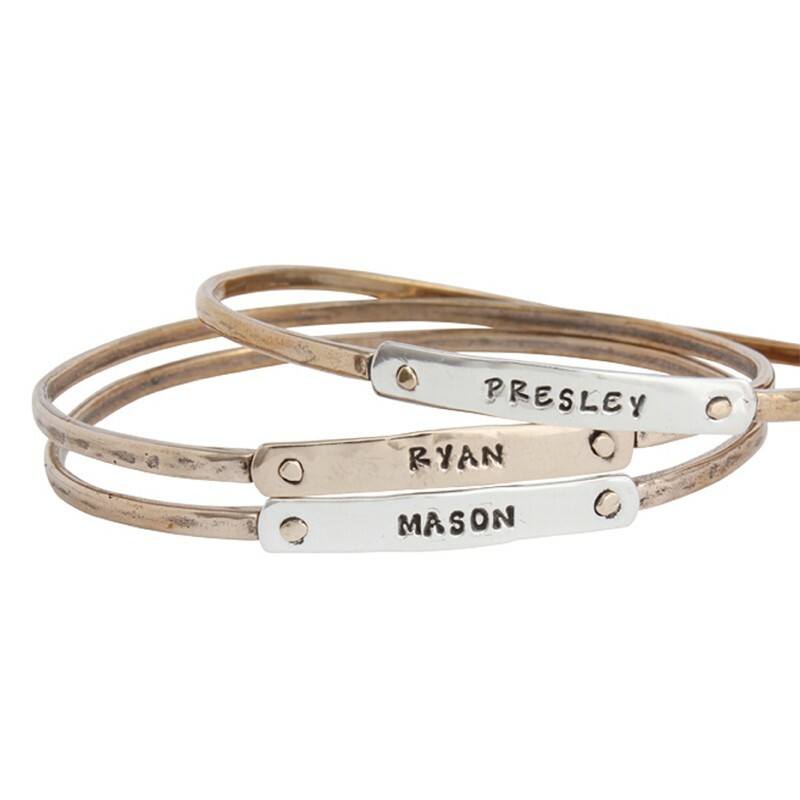 Name Bracelets - The best gift we ever gave my mother was a triple name bracelet from my two sisters and me. 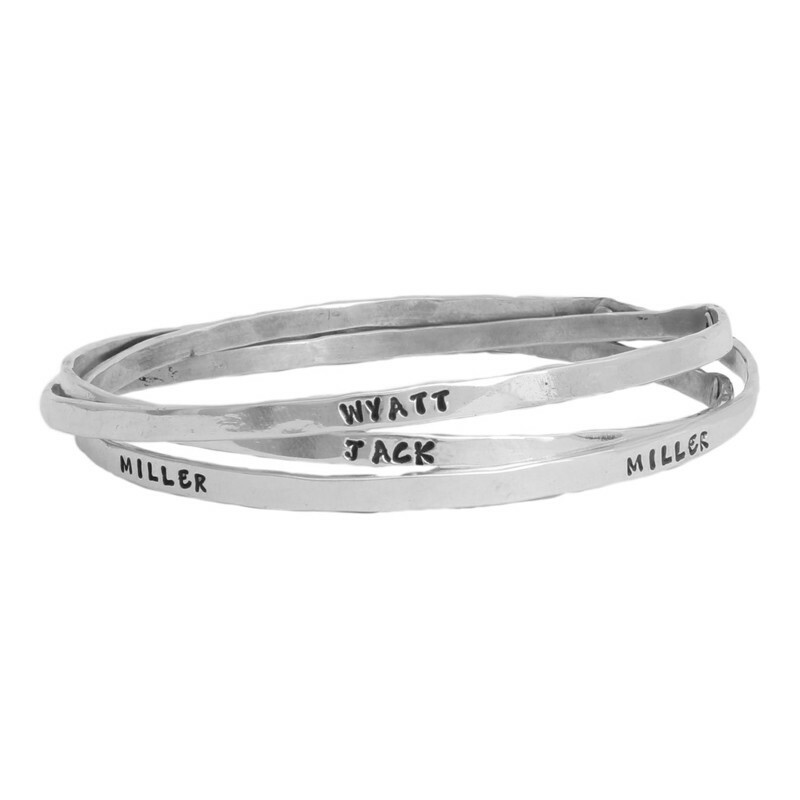 Each bangle represented each of us and on each bangle was stamped the names of our children, her grandchildren. She loves it! And by the way, my beautiful mom is the model you see in most of our grandmother pics! 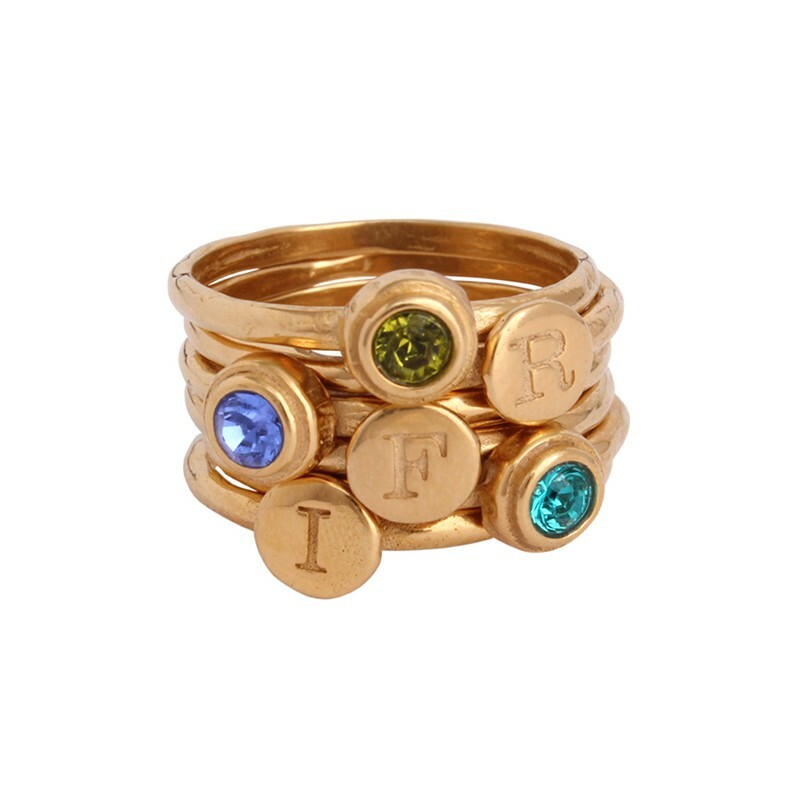 Stackable Initial & Birthstone Rings in gold - while I am a silver girl, every now and then I want to spice things up a little and wear my set of 6 stackable rings. 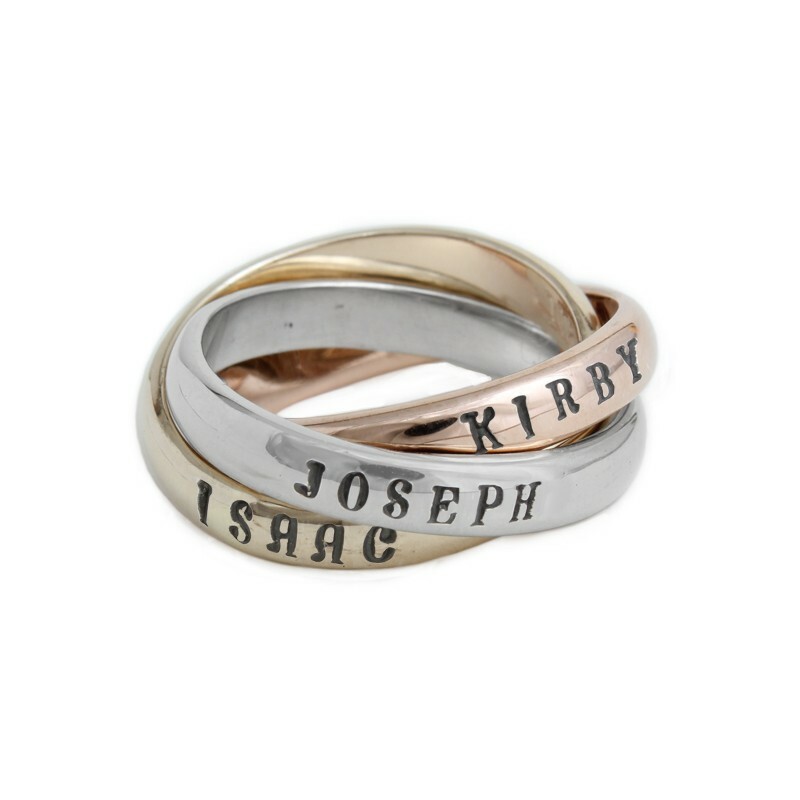 One stack initial ring and one birthstone stack ring for each of my boys. I think what I like the most is the way the birthstone colors pop in the gold. The Heirloom Necklace - Hands down my favorite necklace because it reminds me of my Grandma Bertie. My grandfather gave her a diamond each time my mother had a child. I have two sisters and when my grandmother passed, my mom had the diamonds set in a similar setting. We changed up the design a bit and added a stamped initial on the back. Now I have one to represent each of my boys and one day they will be gifted their diamond for their bride. So shop, enjoy and let us know what are your favorites!